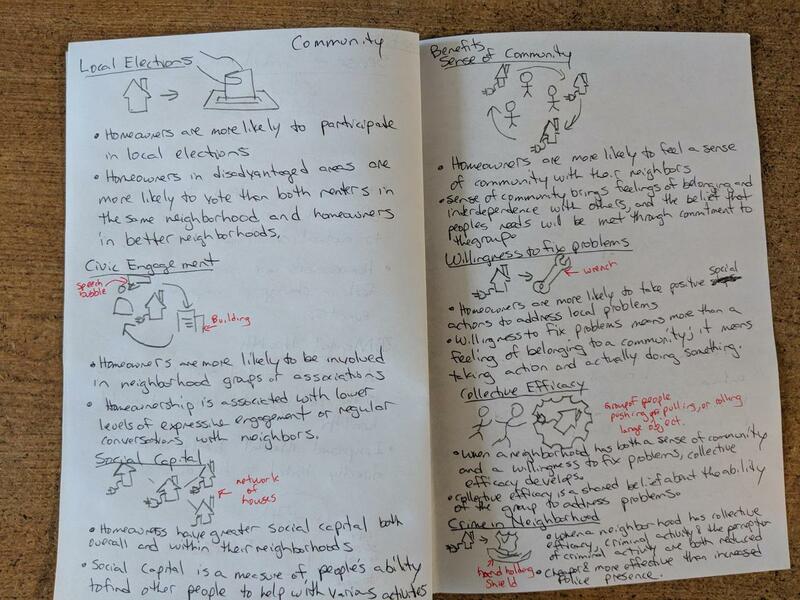 Visualizing some of the field guide entries like "collective efficacy" and "willingness to fix problems" was rather challenging. To help I searched through the Noun Project to inspire ideas. Below are some pictures of my draft field guide along with explanations of my drawings. First, cover of the field guide. 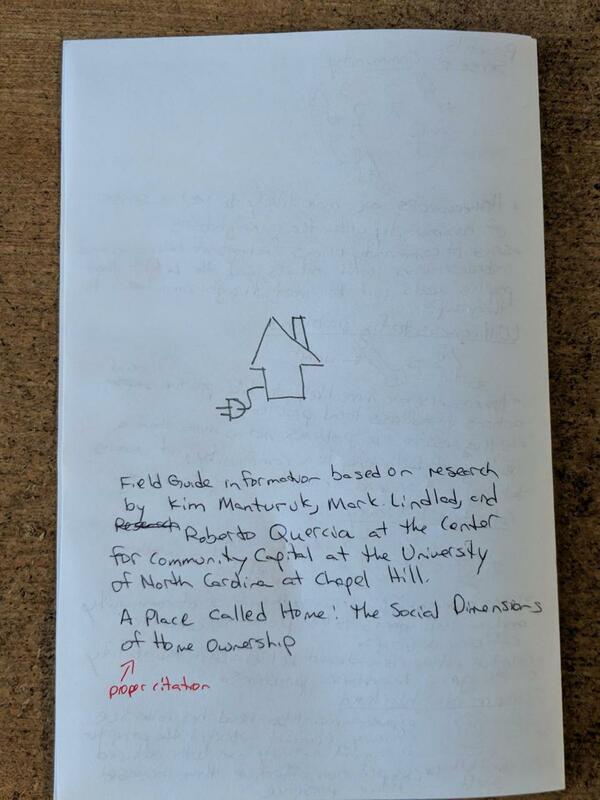 The goal is to draw a monopoly-type house with a power cord coming out of it. The house is lit up and surrounded by a circle of smaller houses that are rotating around the center house. Next, the inside cover. The map is a rearranged version of the map I used in my previous post. 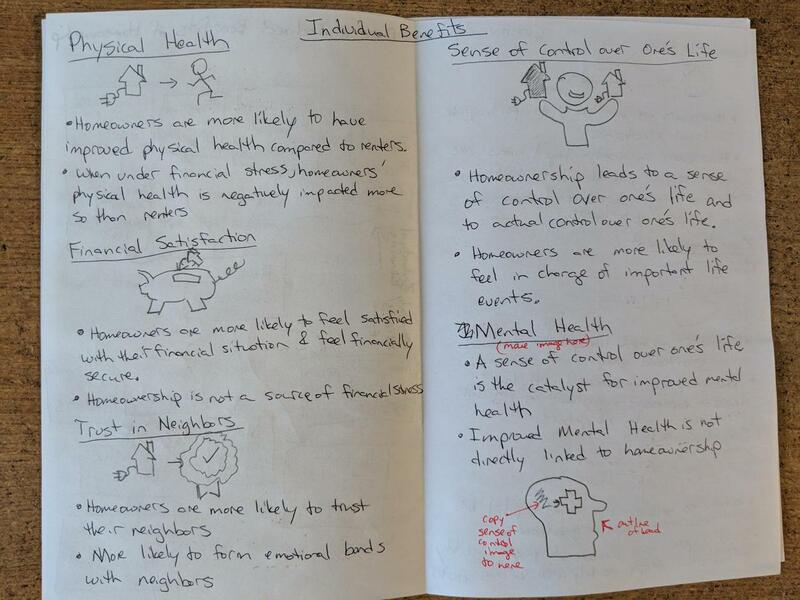 Note: anything in red is a note to the reader to make up for what my crude pencil drawings cannot communicate. 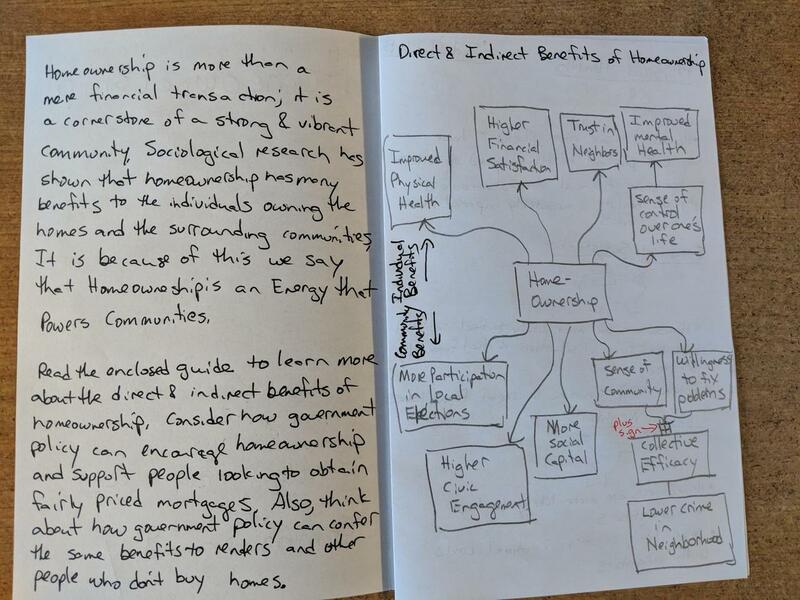 I thought it made the most sense to put the individual benefits together on matching pages. The visual images will relate to each other to properly show the direct and indirect relationships. Next, community benefits. This one is a bit crowded. I will have to think carefully about the layout here. And the back of the field guide. I thought it made sense to cite the research the information in this field guide came from. Also, I should reuse the powered house image. The field guide text might be hard to read through those pictures. For completeness the entries are repeated below. Homeownership is more than a mere financial transaction; it is a cornerstone of a strong and vibrant community. Sociological research has shown that homeownership has many benefits to the individuals owning the homes and and the surrounding communities. 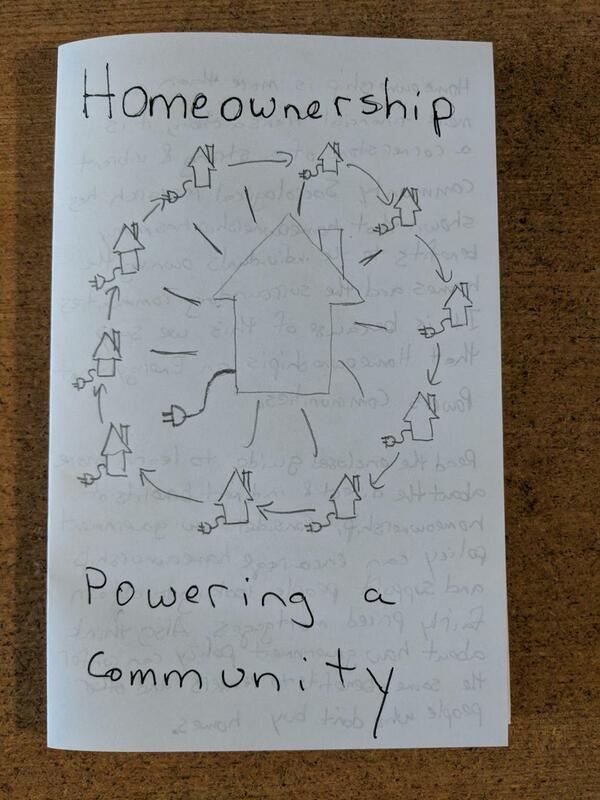 It is because of this we say that Homeownership is an Energy that Powers Communities. Read the enclosed guide to learn more about the direct and indirect benefits of homeownership. Consider how government policy can encourage homeownership and support people looking to obtain fairly priced mortgages. Also, think about how government policy can confer the same benefits to renters and other people who don’t buy homes. Sense of community brings feelings of belonging and interdependence with others, and the belief that people’s needs will be met through commitment to the group. I have some questions about the entries. Are bullet points the right format? Should I provide more detail? Is this the right amount of information? Are the visuals appropriate and convincing? I'm looking forward to getting feedback today during class. For this week we were also asked to engage with a working participant in the field to help our research process. I did reach out to Esther Robinson of Arthome and heard back from her but we haven't been able to schedule a time to talk on the phone. That will take place this week.